Sure enough, American transgender lobby groups are being funded by the likes of billionaires Warren Buffett and George Soros. Why? Because investors want to help normalise the altering of basic human biology, and Big Pharma stands to make a fortune. It’s already started. TERF stands for ‘trans-exclusionary radical feminist’ and is used as a way of denigrating any woman who questions the current craze of people – overwhelmingly men – who say they were born into the wrong body. Basically, it’s a derogatory and offensive label and is used to shut down debate on the fraught subject of transgender rights. Just a cursory glance on social media quickly provides enough evidence to prove it’s anything but a neutral term – as users often claim. It’s common to see slogans like “Kill all TERFs”, and who’re often described as Nazis, fascists and bigots. Daring to question this, I’m now regularly referred to as a TERF. Boxed up, compartmentalised, and considered fair game by those who enjoy hunting in packs online. I am only quoting those who self-identify as 'left' and who used their real names. You can imagine the suggestions I've had from those that don't use their real names, eh. Such fun. Unfortunately that’s the nature of a lot of online ‘debate’ – personal attacks are rife. In this case it is largely left wing versus left wing. They already have. At least on Twitter. So we have to keep on fighting this totalitarianism to spread in real life. The power of debate is being overrun by the power of berate, and worse. On the Rachel Stewart thing: you can disagree with her opinions, her politics, her worldview, but some of the personal abuse on Twitter today has been disgusting and it's all been dished out by people who know better and would cry foul if one tenth of it was aimed at them. It is seventeen years since the United States and Britain went to war (the latest one) in Afghanistan. There was some justof9cation for taking some sort of action, and there have been some successes, but it has largely been a failure. Long entrenched problems there remain unresolved. It shows again that right (sort of) and might are not all-conquering. The US had already had a lesson on the futility of brute strength and ignorance in Vietnam, they were warned Afghanistan could be a mire too murky to force into being a model Western style state, but they tried anyway. Seventeen years ago today, the U.S. and Britain went to war to remove the Taliban from power in Afghanistan. It was morally and politically justified by the Taliban’s failure to surrender al Qaeda terrorists responsible for the Sept. 11 attacks. The Western alliance drove the Islamic totalitarians from power swiftly, within weeks. Yet, we’re still there. On Thursday morning, another American serviceman was killed in battle in Afghanistan. Nearly 2,400 Americans have now died in this war, and Afghanistan is still mired in poverty, chaos, and violence. What are we doing there? Why are we still fighting this war after 17 years? ‘We’ includes New Zealand, with our army deployment extended until next year and that will be subject to review again. The three presidents to preside over this war have all failed to focus the mission clearly toward America’s real interest, which is to prevent multinational terrorist organizations such as ISIS and al Qaeda from establishing a stronghold. Instead, we took up the hopeless and endless task of nation-building. Every audit of American efforts to build a safe and stable Afghanistan have showed failure. The waste in money and lives goes on. The problem is not American incompetence or stinginess, but that the big goal has always been unrealistic. Billions of dollars have been spent on schools, roads, and infrastructure projects in rural areas that remain under the heel of the Taliban. These projects could work only if America ran a police state, requiring hundreds of thousands of soldiers and Marines. I think the US did learn something from their Vietnam nightmare – not to put large numbers of soldiers inn the firing line, but high-tech weaponry has only helped arms manufacturers to test their products and make money. The issue in places such as Helmand is not simply that the Taliban dominate the area and cannot be dislodged, but that the area is a patchwork of fiefdoms run by local tribes with whom we are unable to deal. The Bush dream that guns, money, and lawyers could build stable democratic societies anywhere on Earth has been tested in the field, and it has failed. In Iraq, where there was some memory of institutions, it has largely failed. In remote parts of Afghanistan, it has failed completely. The hubris of the Bush doctrine was deeply unconservative. President Trump has taken a humbler route, directed toward wounding the Taliban to keep it weak, but not pretending to be able to eradicate it entirely. The administration has also finally made Pakistan understand it may not support our enemies in Afghanistan. America’s goals should be to avoid making things worse in Afghanistan, contain the Taliban, and focus more on the Islamic State. These are not lofty goals, but lofty goals have proved to be pipe dreams that produced a 17-year nightmare. What are the goals and dreams now? A ONCE-popular argument that President Donald Trump’s approach to foreign policy is not substantially different from Barack Obama’s is going down in a blaze of trade agreements. Yet on Afghanistan it remains broadly true. Mr Obama came to power describing Afghanistan’s conflict as the “war we have to win”, but never seemed convinced that that was possible. After a stab at escalating the conflict, he devoted his presidency to ending it. Mr Trump has long said the same. His decision to launch a much smaller escalation last year came with the closest thing he can muster to an apology attached: “My original instinct was to pull out, and historically I like to follow my instincts.” Even so, his record on Afghanistan, including this week a promise of peace talks to add to that modest military reinforcement, is starting to look much better than his predecessor’s. This chiefly reflects what a low bar Mr Obama set. Unsurprisingly, then, Mr Trump’s measures have not transformed the battlefield, where the Taliban remain in the ascendant. Instead of encouraging the Afghan government to take back territory, America is reported to be urging it to withdraw from remote outposts to reduce casualties. The level of violence continues to be horrifying, especially among civilians. More were killed in the first six months of this year than in any previous year on record, in part because of increased American bombing. Yet there is at least more confidence that the Taliban can be prevented from taking a major town. And the 315,000-strong Afghan armed forces are said to be improving. Compared with the debacle Mr Trump inherited, this represents progress. 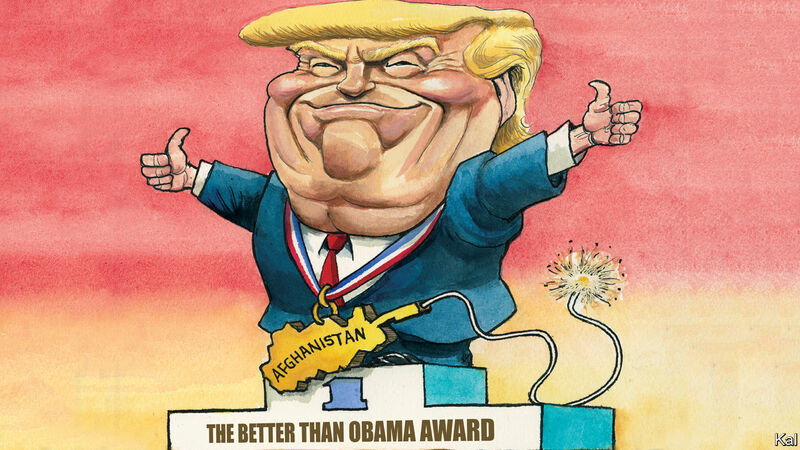 America and its Afghan ally have been keen to negotiate with the insurgents since the demise of Mr Obama’s short-lived surge confirmed their inability to end the war militarily. This is still a far cry from offering Mr Trump a way out. Stitched together by British imperialists in the late 19th century, Afghanistan’s feuding ethnic groups have never shared power uncoerced, and 40 years of on-off civil war have made them even more reluctant to. The government is deeply divided along ethnic lines. It is hard to imagine how its members might accommodate the Taliban—even if they want to be accommodated. It is unclear that the mullahs have given up on a military victory. It is even unclear which faction of the Taliban, the fundamentalist leadership or the more pragmatic rump, their representatives in Qatar might speak for. If Mr Trump does view the putative talks as a means to declare victory and quit Afghanistan, as some suspect, he has simply given up on the place. One year after President Donald Trump announced a new strategy for winning the war in Afghanistan, the United States appears to be no closer to stabilizing the country and quelling the Taliban insurgency, according to analysts and a report issued by U.S. Defense Department. The strategy has included a greater focus on defending population centers while ceding much of the remote countryside to the insurgents. Pentagon officials say the measures are working. But the situation on the ground tells a different story. The Taliban maintain their grip on much of the country, and the civilian death toll has reached a record high, according to a recent report by the Pentagon’s inspector general. Also, the Islamic State in Khorasan, the Afghan arm of the Islamic State, continues to carry out high-profile attacks that have killed hundreds of civilians. An Afghan girl walks amid the rubble of shops in Shadel Bazar after the US military dropped a GBU-43 Moab bomb. Seth Jones, a senior advisor to the international security program at the Center for Strategic and International Studies, said data suggested that the Taliban’s control of populated areas overall, primarily in rural regions, had actually increased. The problem with the administration’s strategy of ceding the more remote areas of the country to the Taliban is that the insurgents increasingly are using the rural terrain to conduct attacks within major urban areas, he explained. Another component of the U.S. military’s strategy in Afghanistan is to build up the Afghan military, train the Afghan air force, and equip it with high-end gear, such as fighter aircraft and UH-60 Black Hawk helicopters. But the Afghan air force’s rapid increase in strike capability seems to be accompanied by a steep rise in civilian casualties. Jones said Trump’s strategy failed in another critical way: It has done little to prevent Pakistan from harboring Taliban fighters. This cartoon from seventeen years ago may still be close to the mark. The only rubble reduction on Afghanistan seems to be it’s size. An Australian “accredited specialist in immigration law” who claims to have been working in refugee law since 1990 has raised some serious questions about Green MP Golriz Ghahraman. Ms Ghahraman is not a refugee or a “child asylum seeker. Her claims of war and persecution do not stand up to scrutiny. Her claim to be a “refugee” is disrespectful to the victims of the regime and the millions of Iranians forced to leave the country under threat of torture and death. MPs have many challenges, often from anonymous people with questionable (or obviously ulterior) motives, but this looks to be a more credible challenge of Ghahraman’s back story and claims. I think it’s fair to say that, after being touted as a new Green MP with a lot of promise, Ghahraman has had a fairly chequered political career so far. Her activities on social media keep raising questions about her capabilities – and her truthfulness, or possible lack of. I have seen her challenged a number of times for incorrect claims including for repeated incorrect claims. Some attacks on Ghahraman, particularly in social media, are nasty, reprehensible. …her profile page on the Green Party website has now been changed to more accurately reflect the legal defence work she did at the Rwanda Tribunal and The Hague, and the prosecution work she did at the Khmer Rouge Tribunal. Her profile page on the Green Party website has now been changed, following her admission that it “could be clearer”. Golriz is an Iranian-Kiwi refugee, lucky to escape war and persecution as a child. She arrived in New Zealand when she was nine years old, and left Iran with her family not telling anyone that they were leaving forever. “We essentially escaped one of the most oppressive regimes in probably modern history, which is the Islamic Republic of Iran and the repression was just a backdrop to a very bloody war with Saddam Hussein’s Iraq,” she says. The Green Party MP, Golriz Ghahraman, came to my attention on 3 August 2018 after she posted a video on Twitter saying, “No human right is absolute. They are all subject to lawful limits.” I responded that in the 1948 Universal Declaration of Human Rights, there are many human rights which are absolute, such as the right not to be tortured or suffer cruel, inhuman or degrading treatment. She blocked me on Twitter. The significance of Ms Ghahraman’s statement is that she has an affinity with Mashhad, which indicates she was living there and not in Tehran. Mashhad is the largest city in eastern Iran, near the border with Afghanistan. It was unaffected by the war, except as a safe haven for many people displaced by the Iran-Iraq war in the west and south. There were no missiles attacks. It is 900 km east of Tehran and 1500km from Iraq, well out of Iraqi rocket range. If she was always living in Mashhad until 1990, the claim of war memories is fictional. Jean gives more details which suggest at least a lack of completeness in Ghahraman’s Iranian past, and also on her claims to be a war refuge. The claim that she is a “refugee” does not stand up to scrutiny. The claim to be a refugee from Iran is a significant claim, historically and morally. Ms Ghahraman has described in the NZ Herald and Stuff online how her parents supported the Islamic Revolution, like many people at that time from all sides of politics who came together to oppose the Shah. She described how she left Iran, with an orderly departure at an airport. The family was issued with passports, given permission to leave the country and allowed to take a holiday in Malaysia. The regime had a watch list to stop opponents obtaining passports and departing from an airport. The issuing of passports, permission to leave for a holiday and an orderly departure, is not consistent with people who were persecuted by the regime. Ms Ghahraman is not a refugee or a “child asylum seeker”. Her claims of war and persecution do not stand up to scrutiny. Her claim to be a “refugee” is disrespectful to the victims of the regime and the millions of Iranians forced to leave the country under threat of torture and death. I think this warrants a response from Ghahraman. Perhaps she can refute Jean’s claims, or clarify. Stefan Molyneux has left New Zealand, grizzling on the way out. In a continued display of New Zealand’s endless hospitality, I was stopped and harassed by airport security for no apparent reason while leaving the country. Did he think he should be given VIP treatment and be able to bypass security? Not a very classy whine from Molyneux. While he was still here he said some outlandish things. Like the business of war talk. Mr Molyneux has now taken to YouTube, uploading a 12-minute video which oscillates between decrying the “demonic mob” that got their show cancelled, and asking for supporters to “like, subscribe and share” – and give him money. “We lost a venue. Hundreds and hundreds of people who had come a long way and were very passionate to hear this conversation, to engage in what Lauren and I were going to discuss, we lost the venue and that’s costly. It’s very expensive, and I need your help”. Both an attention seeker and a money seeker. He said the funding is necessary for him to keep speaking out against the “encroaching mob and horde of mindless violence the left seems to want to unleash on the failing remnants of civilisation”. He was relatively restrained in media interviews while in New Zealand. He tried to provoke reactions here, which successfully attracted opposition and media attention, but via Youtube he shows how dangerous he could be if he got more than fringe support. Without more money, Mr Molyneux fears “self-contempt, self-hatred and possibly incarceration or death itself”, because “that’s what happens when the left gains power”. He then took a shot at Prime Minister Jacinda Ardern, who at the weekend said Kiwis were “hostile” to Mr Molyneux’s views. Mr Molyneux says unless “free speech” is kept alive, “we are going to end up with bayonets pointed at each other’s hearts”. “I am trying with all of my might and all of my rhetoric and all of my energy and efforts to stop the war that is coming. This feral escalation of abuse and violence and threats and deplatforming is going to escalate into war. History is very clear on this point. He seems to be trying hard to make a left-right war come. While general populations seem to be less and less aligned to left or right politics people on the fringes are having to go to extremes to get attention. There is a risk, because if a few on the fringes turn to violence it could get very nasty. It’s ironic that Molyneux is trying to talk up the sort of problems he claims he is warning against. If a Muslim radical came to New Zealand (or spoke to New Zealand via Youtube) with language anything like what Molyneux is using the sort of person supporting Molyneux would be up in arms, metaphorically at least. Molyneux’s visit has raised some important issues about free speech. Through his speech, especially his orchestrated self edited speech via Youtube, he has shown how dangerous he could be if he managed to raise a rabble. Fortunately his Kiwi experience didn’t rise to much. I doubt he will be back. Good riddance to him. Donald Trump’s ongoing attacks on media as ‘fake news’ and ‘enemy of the people’ has been widely criticised, for good reason. See Trump’s “enemy of the people’ attacks teetering on tyranny. But as is typical of Trump when he is criticised, he has escalated his rhetoric. So he emphases his tyrant talk of ‘enemy of the people’ and then ups the ante to ‘War’! One could question whether he is becoming unhinged under pressure – which is a dangerous thing for someone who can easily start wars. Will Trump use a war to try to justify his claims, and then blame it on the media? One thing that is apparent about Trump – he projects. It Trump’s case it may not be unwanted feelings, it looks more like a propensity to blame others for one’s own problems or aims. Purposely cause great division and distrust? That’s exactly what Trump is doing, more and more. Can also cause war? That’s much more likely to be a president than a newspaper. Very dangerous and sick? That could be a very worrying projection. Trump frequently tells lies. Sometimes he may simply make things up to suit his line of attack, but he repeats many of his lies, suggesting in part at least it is a deliberate strategy. He tries to sound truthful (and blame others for lying when they report and criticise him). He is also known for his contradictions. It wouldn’t seem out of character for him to start a war (like starting a war with the media or a trade war), and try to make murder respectable, and at the same time blame others. The Trump attacks are not limited to crazy tweets. He seems to be increasing the number of campaign style meetings where he stirs up crowd emotions, promoting division with attacks on opponents, critics and the media with lies and manipulation – much like tyrants of the past have done. For a long time the US has been able to avoid war on it’s own soil, but a Trump provoked or inspired civil war is effectively under way already. If that turns violent it could get very messy. For how long will Trump be allowed to follow such a high risk path before someone steps in and tries to restore relative sanity? Or will the Madness of King Trump be allowed to continue unabated? That looks like an increasingly risky option. Of course the number of wars doesn’t necessarily relate to the level of damage being done, but reducing numbers suggest fewer areas of conflict. People in democracies have the freedom to debate how good or bad their democracy is, but that’s a huge increase in countries countries with some form of democracy. Historic meeting in Korea, an end to the war? For the first time since North and South Korea split into separate countries after the 1950-53 war the leaders of the two countries have met, at the demilitarised zone that separates the two countries. North Korean leader Kim Jong-un and South Korean President Moon Jae-in have said they will formally end the war (which has never been done to date) and will work towards complete de-nuclearisation of both countries. This is just a step – many meetings have been held over the years (just not between leaders) – but it is a promising step in the right direction. Credit should be given to both leaders for this. The two countries plan to sign a peace treaty, formally ending the Korean War this year, the 65th anniversary of the armistice. “There will be no more war on the Korean peninsula and thus a new era of peace has begun,” the statement says. The two leaders agreed to work for the “complete denuclearisation of the Korean peninsula”. Smiling and holding hands, the leaders met at the heavily fortified demilitarised zone between the countries on Friday, pledging to pursue peace after decades of conflict. Mr Kim became the first North Korean leader since the 1950-53 Korean War to set foot in South Korea, stepping over a concrete curb marking the border at the truce village of Panmunjom to shake hands with his counterpart. “We are at a starting line today, where a new history of peace, prosperity and inter-Korean relations is being written,” Mr Kim said before the two Korean leaders and top aides began talks. Mr Kim told Mr Moon he would be willing to visit the presidential Blue House in Seoul, invited Mr Moon to Pyongyang, and said he wanted to meet “more often” in the future, the official said. Just days before the summit, Mr Kim said North Korea would suspend nuclear and long-range missile tests and dismantle its only known nuclear test site. So a promising move but a lot to happen yet, including a meeting between Kim and Donald Trump planned for next month. Trump may have helped nudge the Korean leaders towards this meeting and pledges, but he is still a loose cannon who could as easily make trouble as make a historic move for the US. In the agreement, the two Koreas “confirmed the common goal of realizing, through complete decentralization, a nuclear-free Korean Peninsula” and “agreed to carry out their respective roles and responsibilities in this regard”. Such language is similar to past declarations, however, and South Korea offered no additional details beyond saying it would closely cooperate with the United States and the international community on the issue. Past efforts to entice Pyongyang to abandon its nuclear program have failed in part due to North Korean demands the United States withdraw its troops from the peninsula and remove its “nuclear umbrella” of support for the South. South Korea has said Kim may be willing to compromise on this traditional sticking point, but no new details were announced at the summit. Trump and the US will have to play a part in this. South Korea and a U.S.-led U.N. force are technically still at war with North Korea and the idea of an official peace deal to change that is not something that can be resolved by the Koreas alone. So the declaration calls for meetings with the United States and possibly China, which were both involved in the conflict. South Korean leaders at the time opposed the idea of a truce that left the peninsula divided, and were not signatories to the armistice, which was officially signed by the commander of North Korea’s army, the American commander of the U.N. Command and the commander of the “Chinese People’s volunteers”, who were not officially claimed by Beijing at the time. North and South Korea have seriously discussed the idea before. In 1992, the two sides agreed to “endeavor together to transform the present state of armistice into a solid state of peace”. The last inter-Korean summit in October 2007 concluded with a declaration by the two Koreas to “recognize the need to end the current armistice regime and build a permanent peace regime” and “to work together to advance the matter of having the leaders of the three or four parties directly concerned to convene on the Peninsula and declare an end to the war”. Again Trump and the US are important to this. A Reuters analysis shows the five decades of communication between the two Koreas. North and South Korea are technically still at war, and contact between them was almost nonexistent after they accepted a truce at the end of the 1950-53 Korean War. Since the early 1960s they have held hundreds of official meetings. The more frequently the two sides have communicated, the fewer incidents there have been between them. But the number of meetings has yet to recover from a peak of nearly 90 sessions in 1992, the year after the Soviet Union collapsed. Here’s a look at the history of every discussion, agreement and major incident – from spy submarines to bombs on planes – between the two sides. Progress will depend on the intent and determination of both leaders, and also of their main allies China and the US. Candidate Trump last year denounced US involvement in the Aghan war. President Trump has just announced an expansion of the longest running war that the US has been involved in. But many of its key components remain infuriatingly vague, such as the number of additional troops he intends to deploy in Afghanistan and how much more money he intends to spend there. Moreover, some of the goals he espoused Monday night seemed inherently contradictory. Mr. Trump did explain why he had abandoned his initial “instinct” to withdraw the 8,500 American forces deployed in Afghanistan immediately. He said that after listening to the generals whose wisdom and views he had denigrated as a candidate, he had become convinced that an abrupt withdrawal would create a vacuum that the Islamic State, the Taliban, and other terrorists would fill. That, in turn, he said, would enable America’s Islamist foes to strike America and its allies, as Al Qaeda had done on September 11th from Taliban-ruled Afghanistan. While Mr. Trump said his administration would no longer engage in “nation-building,” he also said that the Afghan government in Kabul would have to do more to ensure that Afghans do the bulk of the fighting. He did not define what “obliterating ISIS” or “victory” meant, or specifically what conditions on the ground would enable an eventual withdrawal of American forces. That cartoon is from the start of US involvement in Afghanistan 16 years aago. After the Iraq debacle the world should be very sceptical of claims that crappy regimes have weapons that demand urgent military action. But nuclear risks are so large, potentially threatening the well being of the whole plant, that any nuclear threat is a major concern. As are the increasing rhetoric and tensions over North Korea. Nuclear weapons can be used as a threat. They can also be used as a deterrence to being attacked. So far that has more or less worked for those countries that have acquired them, but there is always a very real concern that a mad or irresponsible leader will use nuclear weapons pre-emptively, or just out of spite, or under pressure, or to play to a domestic audience, or for any number of reasons. A nuclear attack is most likely when, not if. The timing, and the degree of escalation and destruction, are probably all that is in doubt, along with who pushes the button. That’s one of the most jarring takeaways in an exhaustive New York Times story about North Korea’s rapidly expanding nuclear program — and the decades of US efforts that have tried, and failed, to slow it. The Trump administration plans to detail its own approach Wednesday when it brings the entire US Senate to the White House for a highly unusual briefing on the North Korean threat. The threat is real. Here are a few more details, courtesy of the Times’s David Sanger and William Broad. North Korea is on pace to have 50 nuclear weapons by 2020. It already knows how to miniaturize those weapons so they can fit into missiles capable of hitting Japan, South Korea, and the tens of thousands of US troops stationed in those two countries. And a long-range intercontinental ballistic missile (ICBM) capable of hitting the US — while not yet in Pyongyang’s arsenal — is now seen as a genuine possibility. That’s not all. As Alex Ward wrote for Vox, South Korea’s capital of Seoul is well within range of the thousands of conventional weapons in North Korea’s enormous arsenal. Pyongyang could devastate the city of 25 million people without needing to use a nuclear weapon. The threat to South Korea from conventional attack has been well known for decades. All of that means President Trump faces the same hard question that bedeviled George W. Bush and Barack Obama before him: whether to risk war to prevent one of the world’s most unstable governments from building more of the world’s most dangerous weapons — including some capable of one day hitting the US. This is, without doubt, a genuinely scary moment, with Washington and Pyongyang both making increasingly explicit threats against each other. The Trump administration has specifically talked about a preemptive strike against North Korea and has a large US Navy carrier strike group steaming toward the region (yes, the same one that Trump had falsely said was heading there last week). And a US submarine docked in South Korea Tuesday as part of an explicit show of force. North Korea has responded with threats to sink a US aircraft carrier and destroy American military bases in Japan (it’s far from clear the country could pull off either one). On Tuesday, it test-fired huge numbers of its artillery pieces (which are basically large guns capable of hitting distant targets), including many of the ones capable of striking South Korea. Many observers expect North Korea to conduct a nuclear test — its sixth in the past 11 years — as soon as the end of this week. Still, none of this means that war is inevitable — or likely. I’m not so sure about the likely bit. North Korea is being put under increasing pressure, and Donald Trump hasn’t exactly earned the world’s trust yet by any means. What the administration wants is absolutely the ideal objective, to prevent North Korea from acquiring the capability to launch nuclear armed intercontinental ballistic missiles at the United States. But the means being discussed, such as putting North Korea back on the list of state sponsors of terrorism (“sticks and stones may break my bones…”), banning the North Korean airline from flying places it will never fly anyway, and banning the import of North Korean seafood (seriously? ), are almost comically insufficient to the problem. Then there’s the “armada,” 3,500 miles away, but, maybe, on the way. These things, and other non-military options which might be considered, all pale by comparison to both the carrots and sticks that have already been used by prior presidents. The hope that President Trump and Secretary of State Rex Tillerson can persuade China to exercise maximum leverage against North Korea — perhaps shutting off energy supplies, or stopping the regime from reaching nuclear ICBM capability through sanctions-backed diplomacy, while also preventing it from “going out with a bang” if it thought it would be stopped — is almost certainly a mirage. Likewise, even the best offensive cyber-wafare operations can do little more than slow down the march toward nuclear capability against us. Even limited preemptive military action won’t work. How could merely wounding and cornering a fierce animal not lead to a rageful last gasp of dreadful retaliation? There is a good reason none of these are viable options. It’s because, from the North Korean point of view, only achieving that most fearsome military capability can provide reasonable assurance of this regime’s long-term existence. So here is the truly horrible truth about North Korea. There are only two choices. The first is that we acknowledge and accept, as we have done with Russian and Chinese ICBM capabilities for decades, and then try to deter and contain, and to defend against, a North Korea able to strike us with nuclear weapons. …the alternative, the only alternative, is war. War waged to victory, not stalemate. War waged and won before the North Koreans achieve their weapons development goal. War waged with both sufficient force and tactical surprise, so as to not leave the opponent wounded, cornered, and still able to lash out. This means the WWII notion of war, one aimed at toppling the enemy regime and destroying its capacity for harm, not limited “surgical strikes” aimed to send messages or merely degrade the other side. In the case of North Korea, limited war would almost certainly lead to total war, which would likely include the North’s use of nuclear weapons. So if any use of force will very probably lead to total war, it needs to be total war from the outset, on the most advantageous terms from our perspective. Frightful though it surely is, there is a clock ticking on this decision, and sound judgments cannot be made on the basis of false premises. Our choices are both bad and difficult. Our choices are acceptance or war. It’s hard to see any alternatives to those two options.